Scientists are trying to understand what they call "bizarre surface brightness patterns" seen in this October 26, 2004, composite image of Saturn's mysterious moon, Titan. Note the peculiar "noodle" features in the upper right corner of the unidentified dark area. Image Credit: NASA/JPL/Space Science Institute. November 25, 2004 Pasadena, California - This week, NASA released this extraordinary mosaic of nine processed images of Saturn's mysterious moon, Titan. 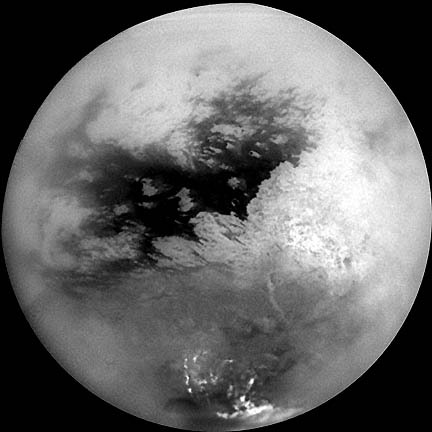 This image overlay is the most detailed view of Titan ever seen from Earth and were acquired during the Cassini spacecraft's close flyby of Titan on October 26, 2004.